The EBC is a hybrid business structure that runs on a combination of principles borrowed from For-Profit and Not-for-Profit business structures. Membership dues are entirely used for the administration of the organization. Administrative costs include Website maintenance, compensation to staff and contractors hired to administer the EBC, travel expenses, marketing and other routine business expenses. 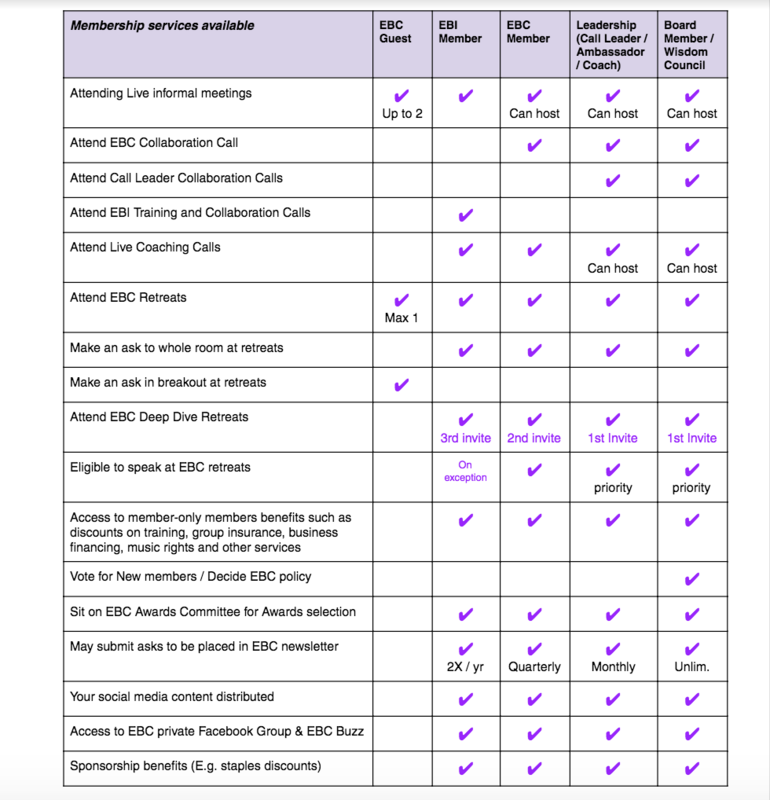 Decision Making Structure Policy for the EBC is set by the elected EBC Board. 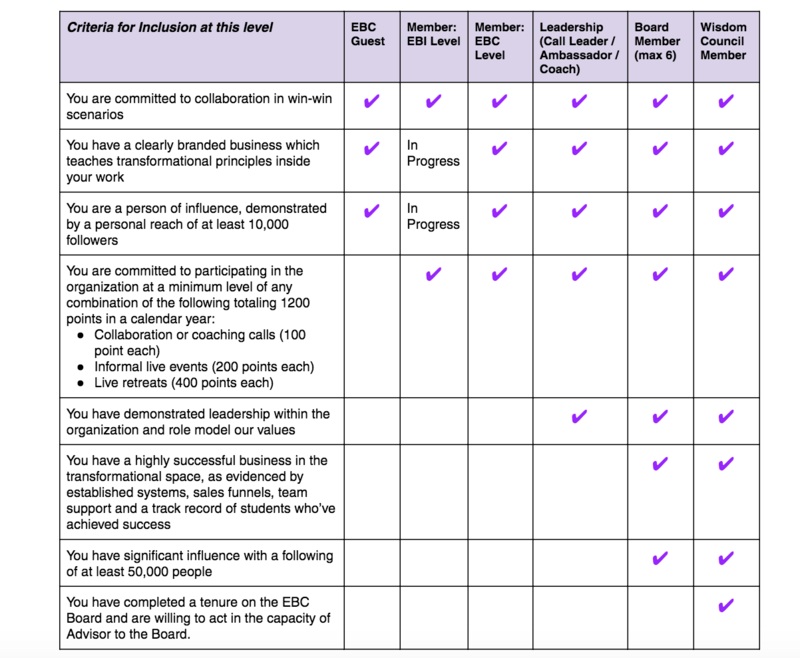 To stand for election for the EBC Board, a member must meet the minimum criteria to be a Board member. New Board Members are elected by existing members of the Wisdom Council and Board. The Board is comprised of 6 elected members, on three year terms, and one permanent CEO position held by Teresa de Grosbois. The CEO position does not vote on decisions unless a tie-breaker is needed in voting. 1. A Wisdom Council, made up of past Board Members can be called upon to make the policy decision when the Board is stalled or in conflict of interest in making the decision; In the event that a policy on a specific element does not yet exist, the EBC Staff makes the best decision available based on their judgement, until such time as a policy can be created. This is typically done in consultation with a committee or representative of the Board. The EBC Board is made up of 6 Appointed senior members which transition on 3 year terms and one non-transitioning role. Teresa de Grosbois is the one non-transitioning role in the role of EBC Chair. Teresa only votes in the event that a consensus is not achieved and a tie-breaking vote is needed. Teresa may also over-rule if a decision puts the organization at risk in some way or may escalate some decisions to the Wisdom Council if she believed there is a real or perceived conflict of interest in the Board making that decision. Every year 2 Board Members transition and 2 new Board members are elected. This happens at the Senior Leadership meeting held the day before the Annual Retreat. As the Wisdom Council Grows we may have Board / Wisdom Council Mastermind calls if there is a request. New opportunities will be emerging for this group. The Board and Wisdom Council will Nominate Board positions at the annual Leadership retreat. People are also free to transition to Wisdom Council sooner if they wish. Includes a defined feeder into EBC membership (must be structured and approved). This recognizes that the event host will also be offering their own programs and the EBC feeder should not conflict with this. Includes a post-event evaluation for quality control and measurement of whether the EBC feeder was effective.